I mean sure, there was the ‘micro pig’ pet craze, where people followed celebrities’ leads and purchased cute little pigs as companions. What you maybe didn’t hear about was the sheer number of innocent pigs who were abandoned once the novelty wore off; or the many pigs who were bred to look like micro pigs but were in fact just piglets – baby pigs. I personally know of pigs like these who simply kept growing and their owners had to give them up as they lived in a flat! Those lucky pigs ended up in a sanctuary, but because of the way they were bred by unscrupulous idiots chasing a fast buck, their legs were too small to support their bodies when fully grown and so they died young. Pigs have mastered computer games that have stumped dogs and even some primates. Research shows that they have a level of self awareness that babies don’t have, by using a mirror to find food. Pigs are smarter than three year old children, so why do we, as a society, think it’s ok to pen them up in horrific conditions, only to kill them for meat before they’re six months old when their natural lifespan could be up to fifteen years? Why indeed. Because we’ve known for a long, long time how clever they are. The tale of ‘The Learned Pig’ who used to tour county fairs in the late seventeen hundreds, had been trained by his handler to spell out words (interpreting subtle signs from his handler), to tell time and even to read minds! These days, a quick search on youtube will take you to pigs doing the kind of tricks you would expect dogs to do and yet we love dogs, and kill pigs for food. Pigs deserve respect, not to be killed for meat. 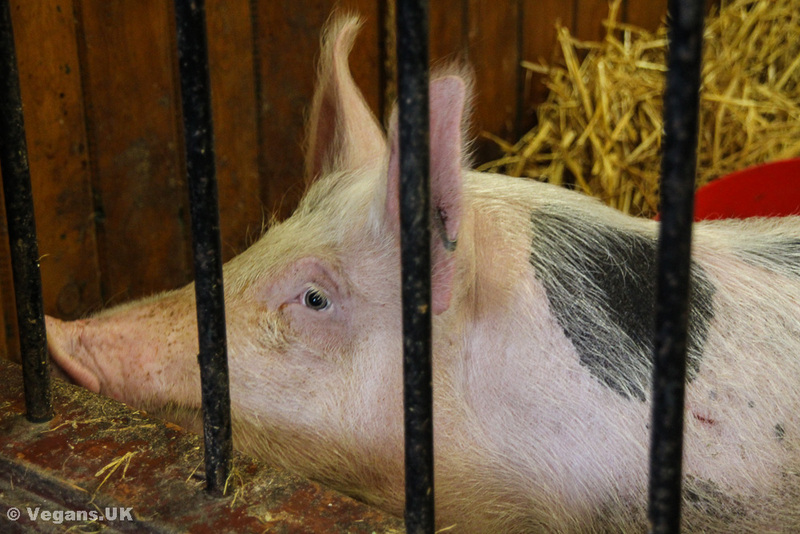 The cruelty of the conditions in which farmed pigs are kept in this country are hard to exaggerate. One undercover investigation after another reveals that even so-called ‘high welfare’ farms are keeping pigs in their own personal horror movies. A chain hanging in their cramped cage counts as ‘an enriched environment’ to comply with the law. Farrowing crates are still legal in this country, so breeding sows are kept in a metal cage so small they can’t turn around, being driven mad at not being able to properly care for their piglets. She is kept this way five weeks at a time, for three to five years, after which she too is killed for meat. The most recent investigation I’ve seen is Viva!’s into a Red Tractor Approved pig farm that supplies Morrisons. It’s a tough watch/read but if you want to know the truth about British pig farms, then this is it. Don’t think you can simply get pig products from another supplier as everyone from Tesco to Sainsbury’s to Marks and Spencer to Whole Foods so-called Happy Meat (another glaring misnomer) have been shown to get their pork, bacon and ham from disgusting, depressing houses of horror just the same. We cheer for pigs, then eat them. Why? Pigs are of course not only to be valued for their intelligence. The fact that they can feel pain and joy and fright and pleasure just the same as us should be enough for us to know that killing them for meat is wrong. Sometimes though, when you reveal a surprising fact about a farm animal, it can lead people to view them in a different way. Several years ago in January 1998, two pigs managed to escape from a truck bound for the slaughterhouse and the ensuing chase had the whole country routing for ‘The Tamworth Two.’ They dodged everyone, even the RSPCA. When they were eventually captured, a national newspaper purchased them, named them ‘Butch and Sundance’ and sent them to live on a sanctuary. They lived to a ripe old age, both passing away in 2011 seven months apart. I wonder though, when people sit down to watch ‘Babe’ or cheer for the Tamworth Two, are they doing it while munching on a bacon sandwich? Or have these tales led them to choose vegan bacon instead? When you make the connection, it’s not a difficult decision to make. Sponsor an ex ‘micro pig’ here. Read about Toby the Learned Pig here.